A day of fishing, food and fun raised $16,000 for Sweet Louise Members thanks to Brett and Sandra Fleetwood from Scorpio Agencies Ltd. 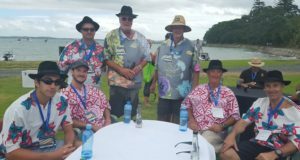 The pair brought a great fundraising idea to life a few years ago and have now held the fabulous NZ Textile Fishing Competition six times! Held on Motuihe Island, a hundred or so folk from the textile industry come together to fish and play. Many of them generously donated some amazing auction items which is held on the beach after fishing is done for the day. As official auctioneer, Brett does a great job in encouraging everybody to spend up large. And they did! $16,000 gives 32 Members their yearly allocation of vouchers.